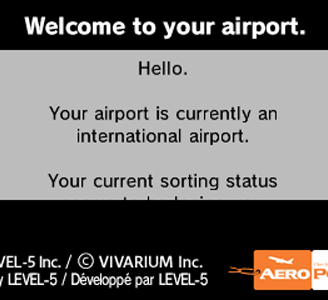 Aero Porter is a Simulation Game developed by Vivarium Inc. and published by Level-5. Aero Porter was originally released at Retail as part of the Guild01 compilation in Japan. This page concerns itself with the separate eShop release. For information on the Japanese Retail release it was a part of, please see the page for Guild01. Aero Porter works well in Citra. Graphically, the game’s intro movie flickers and the game requires decent hardware to obtain full speed.